"So, the Sea Beggar lives. You have failed!" Admiral Gaspard de Coligny - prominent protestant Huguenot who's got a group of them staying in his house. He supports the protestant Dutch, nicknamed the Sea Beggars, in their war with Catholic Spain so has become known as the Sea Beggar. Charles Preslin - Huguenot apothecary who's being persecuted for his religious and scientific beliefs. Last person to see the missing Doctor and has disappeared since. Anne Chaplet (middle right in the photo above) Huguenot servant girl who while working for the Abbot overheard a plot to kill Huguenots and assassinate Prince Henri of Navarre. Landlord - allows Huguenot drinkers in the tavern but reports to Simon Duval. Abbot of Amboise - prominent Catholic persecuting Huguenots. The Double of the Doctor. Roger Colbert - Catholic secretary to the Abbot. I can recognise him cos he's played by Chris Tranchell. B) hope no new characters are introduced! Steven wants to seek the Doctor at the Abbot's house and disguises himself. In the Louvre, the Queen Mother, the King, the Marshal, the Admiral, and Charles de Teligny discuss allying themselves to the Dutch but conversation turns to protestant Huguenot persecution. Steven meets the Abbot bringing Anne with him as Marshal Tavannes arrives. Waiting outside they overhear the conversation discussing killing the Sea Beggar and leave to speak to Nicholas just before they are recognised by Roger Colbert. Admiral de Coligny is shot and wounded on his way home from the meeting. Nicholas and Steven take the wounded Admiral home, while the Catholic conspirators blame the Abbot for things going wrong. 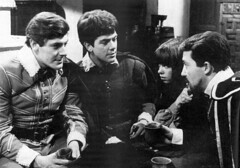 The Huguenots believe that the Abbot is behind the assassination but Steven denies it believing him to be the Doctor. However word arrives that the Abbot has been killed. The Queen Mother incites the King to believe his life is under threat from the Huguenots. Steven returns to the Abbot's house to see if the body is the Doctor. The crowds believe the Huguenots are responsible and are demanding blood. When Steven arrived Roger Colbert identifies him as the killer forcing him to flee. Right that made a bit more sense now I'm sure who everyone is. However as a story it's still not doing much for me: Steven spends lots of the time running around confused. TOLIGNY: The Abbot of Amboise was murdered just outside his own house. TOLIGNY: The Abbot is dead and they're blaming it on the Huguenots. STEVEN: But, he wasn't the Abbot! CHARLES: Ha, ha! Admiral, come with us. We are going to play tennis. DE COLIGNY: Your Majesty, I must beg to be excused. I have work which must be done. CHARLES: Oh, my dear Admiral, we are pleased with you. Since now our mother will not speak to us for the rest of today, you will come with us. I have a new racquet I want you to see. Come. CHARLES: Now what's the matter? Why must I always be interrupted? And I was winning. It takes the attempt on de Coligny's life to rouse him which puts him into conflict with his mother, the Queen Mother Catherine de Medici. CATHERINE: You summoned the council? CHARLES: I gave orders I was to be left alone. CATHERINE: Without my knowledge or consent? CHARLES: I asked to be left alone, mother. CATHERINE: The threat over your friend, the Admiral. You are the King. CHARLES: Yes, I am the King, and to be obeyed! Now keep out of my sight unless you care to end your days in a convent. CATHERINE: I would wish you have the courage, my son. CHARLES: I have but to give the order. CATHERINE: Summon your guards, have me arrested. But you had better have a good reason for the council and for the people. CHARLES: The attempted assassination of my Admiral, by you and Tavannes. Do you deny it, Madame? CHARLES: Have a care. I mean what I say. I shall send Tavannes to the block! CATHERINE: You would execute the Marshall of France for doing his duty? CHARLES: Duty? He's an assassin! CATHERINE: He tried to rid you of a dangerous enemy. CHARLES: de Coligny is my friend. You, Madame, are my enemy. CATHERINE: If ever I were to be. CHARLES: May God help you. CATHERINE: Look at these before you decide who are your enemies. You think the Huguenots would stop at killing me? They want your blood too. CHARLES: So you keep telling me every day of my life. Why? I protect them. They're all my subjects. What have they to gain? This exchange seems to make the Queen Mother's previously contradictory actions much clearer. She has arranged the marriage of her daughter the Catholic Margaret of Valois to Huguenot Henry III of Navarre, which was being celebrated in episode one as a way to bring the Catholics and protestant Huguenots of France together. Now, coupled with the order to have de Coligny assassinated, it would seem to be part of a larger plan by her to ferment tension and attack the Huguenots. 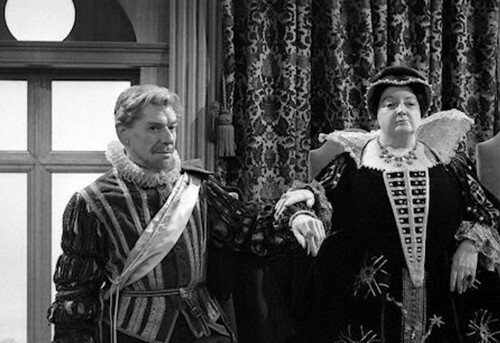 Joan Young plays Catherine de' Medici, pictured above with André Morell as Marshal Tavannes. She specialised in battleaxe parts and can be found in many 1950s and 60s comedy films including The Plank. The new character we can't see a picture of is Teligny played Michael Bilton. He had a long television careerand later played Collins in Pyramids of Mars and a Time Lord in The Deadly Assassin. Onto the new extras used in this episode, and again I'll group them by their role. Top of the list of Parisians in Rue des Fosses St. Germain will be Derek Martin, stuntman & Charlie Slater in Eastenders, who we last saw in The Romans episode 4: Inferno and next shows up in The Web of Fear episode 1. Peter Stewart returns as a Policeman in The War Machines Episode 1 while Eddie Davis is a worker in episode 3 of the same story. Valerie Stanton returns for the penultimate Patrick Troughton story where she's the Issigri Secretary in The Space Pirates episodes 2-6. Onto the Parisian Men and a distinctly Excellent theme develops here: Len Russell was an Alien Delegate in Mission to the Unknown. Delegate Detective isn't certain which one he is though! Eric Mills was in episode 8 of the previous story, the Dalek Masterplan: Golden Death as an Egyptian Warrior a role that Barry Noble plays in episode 10 Escape Switch. He is then an Inferno Customer in episode 1 of the The War Machines before playing a Cyberman in episode 4 of the Moonbase. Declan Cuffe is another Inferno Customer in the first episode of the War Machines and is also a Cyberman in episode 3 of the Moonbase as well as the preceding episode. Edward Phillips is in the first three episodes of the same serial as No 7: Scientist Bob Anders while Jerry Holmes is one of the Cybermen in The Wheel in Space Episodes 2 - 6. Alan Wakeling is a worker in episodes 1 & 3 of the War Machines while Pat Leclerc is a Worker / Soldier in The War Machines: Episode 3 and a Soldier in The War Machines Episode 4. The only one of the Parisian Woman who trouble the scorers again is Marguerite Young who is back in the fourth episode of this serial 4 as the Woman with Dog. Of the Council Members Les Shannon reappears first in The Gunfighters episodes 2 & 3 Don't Shoot the Pianist & Johnny Ringo as a Lynch Mob Member before returning in Doctor Who and the Silurians: Episode 6. Graham Tonbridge is in The War Machines Episode 1 as a Journalist while Robert Pearson is a Soldier in Episode 3 of the same story. Of the Guards Dennis Plenty was a Tavern Customer in episode 1 of this series, War of God. He has the inevitable War Machines credits appearing in episode 3 as a Worker / Soldier and a Soldier in Episode 4. He's then a Prison Guard in Frontier in Space Episodes Two & Three, an Exxilon in Death to the Daleks Parts Two and Three, a Peasant villager in The Masque of Mandragora Part One and a Brother in part three of the same story. 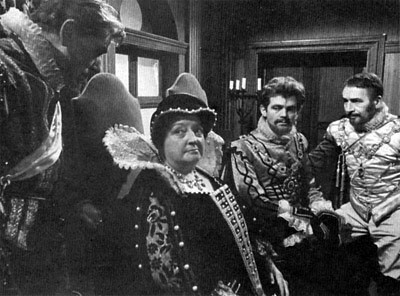 Brother (uncredited) The Masque of Mandragora: Part Three. Another guard Nigel James in in The War Machines as a Inferno Customer / Man in Crowd / Soldier. Did they not keep track of which extra was doing what in the War Machines? As a note this is the last episode to credit Donald Tosh with being script editor. He's done extensive rewrites on this story but BBC rules have prevented him from taking an on screen credit. Most of the remaining stories this season are commissioned under his reign so his influence is felt for a while yet. War Machines is the first story to be 100% developed by the new producer & script editor team, the latter of which we will meet for the first time next episode.